Provides access with ponies, and to ponies, for anyone, anywhere. Wheelchair accessible South Downs Way. AAA How we do it. AAA Access All Areas. Why? AAA Access All Areas, Where. Pony Access, ethical safety rationale. © Simon Mulholland 2013. Let’s hear it for the feet. Horses scared of horse drawn vehicles? Pony Access, what we do. Ellen Tinkham visit to Shillingford Organic. Obama on Black Beauty on Whips. Pony Access has a new website, http://www.ponyaxes.com. Please go there for up to date information. Thank you. Simon. 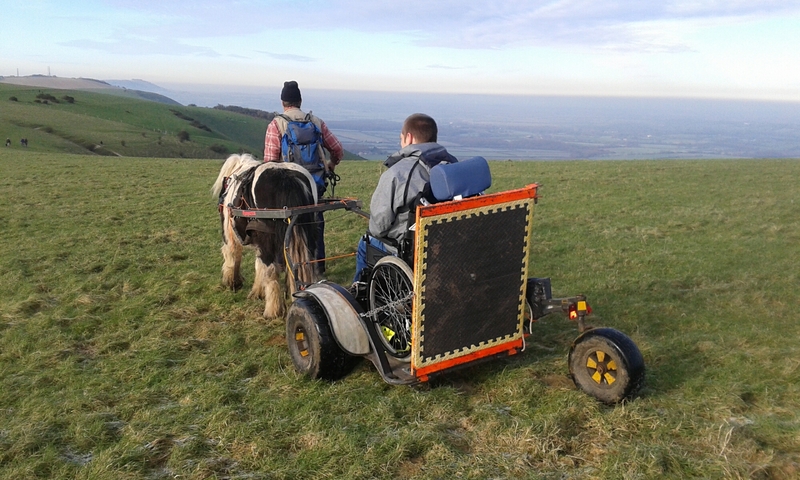 Pony Access makes the South Downs Way, the first fully inclusive National Trail. 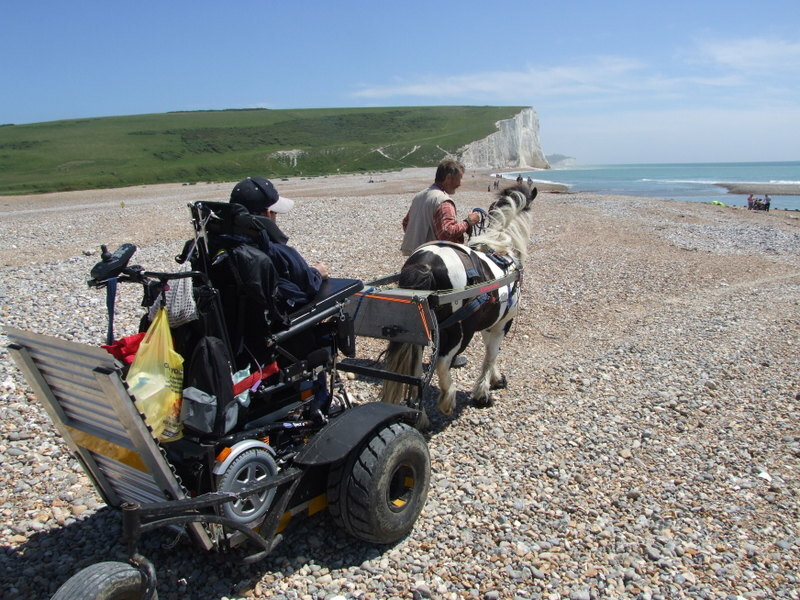 Now, anyone can go from Beachy Head to Winchester, cross country, through some of the most beautiful scenery in England, regardless of ability/disability. 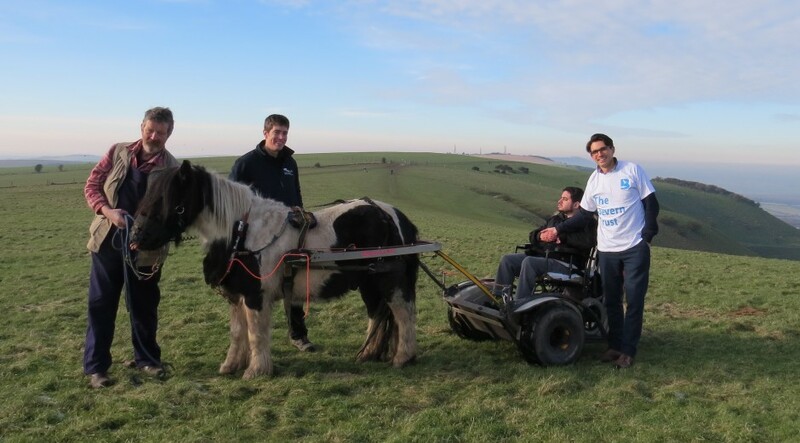 Andy Gattiker, Trail Officer of the South Downs Way, and Matthew Cornish, Salim, Mark and Holly of the Bevern Trust, celebrated the first, fully wheelchair accessible National Trail on 19.1.2016 in appropriate style, taking two people in their wheelchairs along the South Downs Way heading west from Devil’s Dyke. Glorious sunshine, frozen ground and stunning views made a suitable launch day, but the system is just as effective, (though not as photogenic) in driving rain and deep mud, across chalk and flint, through tussocky grass or deep sand. Even the shingle at Cuckmere Haven is no problem. 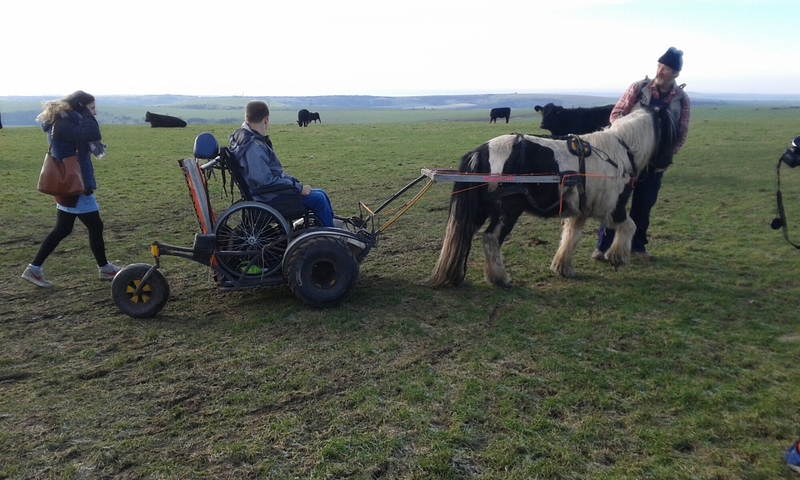 Pony Access lets you use your own chair. This is clearly vital if you can’t transfer without hoists, or you need on board medical equipment. In addition. Pony Access can act as a taxi service, taking you to a picnic spot, bird,butterfly or hang glider watching location, barbecue or whatever. Pony Access is about access. We use ponies because they are the best all terrain propulsion system. With the Pony Access safety systems we get all the benefits of ponies without all the traditional dangers. If you like ponies, that’s a bonus, but Pony Access is about access. 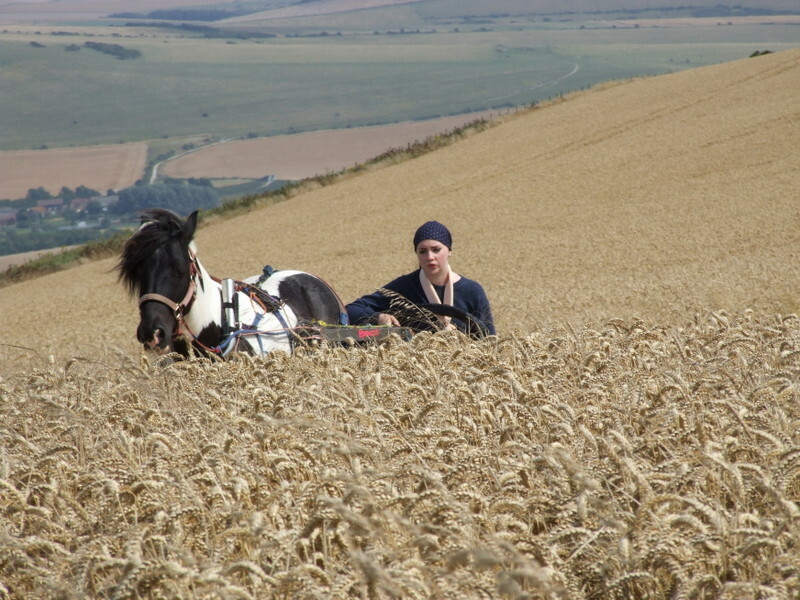 The South Downs Way is about access. The South Downs Way is now the first totally accessible National Trail anywhere in the world. Anybody, any wheelchair, Beachy Head to Winchester. Come and give it a go. Pony Access back in business! One Wheelchair, No Fridge. Roadkill. One Wheelchair, No Fridge. Lions en route. One Wheelchair No Fridge #OWNF Start.